What our clients are saying about our team of HR Consultants. “I’ve been the CFO for Tandem Engineering for over ten years. Human Resources has always been part of my responsibilities. My biggest HR concern was whether the company was compliant or not. It’s next to impossible for me to keep up with all the changing employment legislation and regulations. So, we hired Workwise to do an internal HR audit to find out where we stood. It was a very eye-opening experience. The audit found several areas that needed changing in payroll, employment contracts, and our employee training in Health & Safety and AODA. It has given me peace of mind knowing by making these changes we’ve mitigated the potential risks. “I am a small business owner and we were struggling with attracting good people and keeping them. Our budget was limited, and we were looking for cost controlled solutions. We worked with Patty from Workwise, who helped us put together a scalable recruitment and retention program. What I found unique was that she showed how addressing (or not addressing) HR issues affected our bottom line results. It’s often easier to overlook HR concerns but seeing the financial impact makes it hard to ignore. Patty’s extensive knowledge of HR has helped us grow our business with some exceptionally talented people.” – Michael Downey, CEO, Downey & Brothers Co.
“Patty Young at Workwise helped us developed a policy and procedure manual when we opened an office in Canada. We had a manual from our US head office, but it had to be revised to meet Canadian standards. The new manual was very comprehensive including forms and tips for our managers. What I liked most about the final product is that it’s easy to read and understand. 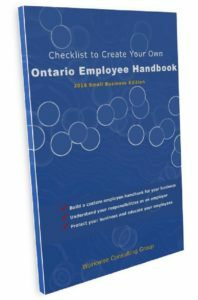 The manual resides on our intranet, employees can easily get answers about statutory holidays, vacation, benefits and all their other HR questions. All new employees are shown how to use the manual during their orientation. What a time saver not having to field all their HR questions.